Lack of support can lead to isolation. Choosing where an aging parent will live is one of the most difficult and emotional decisions many of us will ever have to make. Eighty-five percent of seniors want to remain in their own homes, known as “aging in place.” They might live in the only home they’ve known for years, maybe where they shared a life with a spouse or even where they raised a family. They feel comfortable in familiar surroundings and want to hold on to their memories. Among the 15 percent of seniors who respond they don’t want to stay at home, reasons may include isolation, a reduced quality of life and possible economic hardship. Most baby boomers grew up in auto-dependent suburbs in the postwar era, and that’s where many of them have stayed, according to StreetsBlogUSA. If the time comes when you have to decide where a loved one will live, these three important considerations make a great starting point. Regardless of where a senior resides, true quality of life requires social interaction. Isolation can contribute to malnutrition, lack of proper health care, financial problems and more. Often, a senior tries to hide these problems because she doesn’t want her family to think she’s no longer independent. 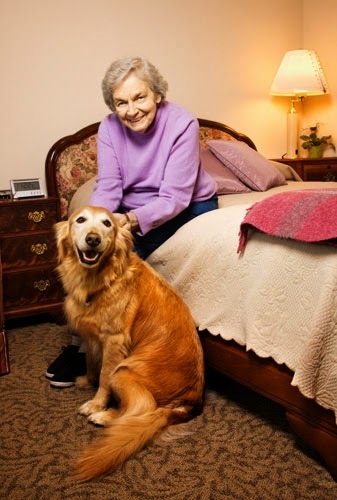 Residents of assisted living facilities and nursing homes have opportunities on site for daily interaction, social programs and other amenities. Seniors who stay in their own homes need a support network of family, friends or neighbors who can provide companionship and transportation to grocery stores, doctors appointments, and recreational outings. With this kind of support, it’s possible your parent can live at home safely and comfortably, where he has control of his quality of life and independence. Peace of mind often is an influential factor in choosing where an aging parent will live. We don’t want to think about mom or dad experiencing a fall, especially when all alone. We of course want safety monitoring, 24-hour access to emergency communication, and to know they’re getting proper nutrition and personal care. If a loved one isn’t ready to move into an assisted living or nursing home facility, it’s necessary to find the right tools and support network to make living at home a success. By incorporating certain design principles, telecare and monitoring, and assistive tools and support, our loved ones can enjoy the health and well being that come with having a choice in care and living arrangements. Let’s look at the cost of in-home care vs. an assisted living facility or nursing home. The cost per hour of in-home care is $9 per hour at the low end. At this rate, it would cost approximately $274 monthly for one hour of care per day, and $6,570 for 24-hour care at that rate. At the average cost of in-home care, $19 per hour, it would cost about $578 per month for one hour a day and $13,870 per month for 24-hour care. At the high end, $30 per hour, annual costs range from $913 for one hour per day to $21,900 for around-the-clock care. Now let’s look at 2014 costs for assisted living facilities and nursing homes, according to data provided by Genworth Financial. In Wisconsin, the state median cost for a private, one-bedroom unit in an assisted living facility is $3,850 per month. Median nursing home costs are $7,280 per month for a semi-private room and $8,121 per month for a private room. To determine your break-even point, estimate how many hours per day care is needed for a loved one and the hourly cost of your in-home care provider, then compare to the median monthly costs for your state using the Genworth tool. Be sure to check out this article explaining the types of care options and how to start a housing search: What If You Had a Week to Find a Place to Live? No one looks forward to the day she has to make this decision. But today’s technology, product innovations and community support may allow you to push back this day for years. Watch this video on choosing an in-home care agency.